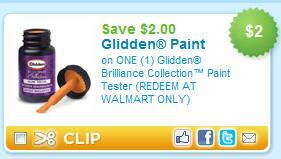 Coupons just released a hot coupon good for $2/1 Glidden Brilliance Collection Paint Tester. Click here, use the zip code 90210 and click the “Household” category to find it faster. Most Walmarts have the 2 oz for under $3, so this should make for a great deal.